Mumbai. During today’s press conference atthe brand’s flagship showroom in Mumbai, Porsche India announced the arrival of the first 911 GT3 in the country. Boasting more power, more precision and a systematic lightweight construction, the radical two-seater promises the perfect combination of racetrack and road driving. Equipped with a redesigned chassis featuring rear-axle steering, the new model benefits from Porsche’s unrivalled motorsport heritage and is built on the same production line as other thoroughbred racing cars. For the first time, Porsche offers two transmission variants of the manufacturer’s most successful GT sports car. Its 500hp four-litre flat engine is a carbon version of that found in the 911 GT3 Cup, and produces 460 Nm of torque. When equipped with the standard seven-speed double-clutch transmission (PDK), the model reaches 100 km/h in 3.4 seconds, achieving the fastest-possible lap times and a top speed of 318 km/h. Motorsport purists can opt for a lighter six-speed manual transmission at no extra costs. The new GT sports gearbox with dual-mass flywheel features a shorter shift lever, short shift paths and precisely engaging gears. 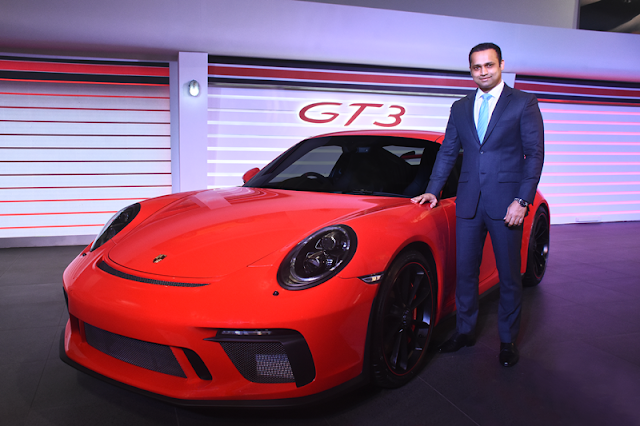 Commenting on the new model, Pavan Shetty, Director of Porsche India, said: “Motorsport is an integral part of Porsche’s DNA; it is racing heritage which gives us the edge in delivering true sports cars with exceptional everyday usability, and no more so is that apparent than with the 911 range. Porsche’s iconic model has been has been developed on racetracks over five decades and we are immensely proud to announce the arrival of our first 911 GT3’s in India today.” He adds: “We have noticed a rising demand for sports cars in our market, and with the 911 GT3 blurring the line between racetrack and road more than ever before, we have no doubt it will meet that demand and offer a thrilling driving experience to our customers both on the road and the track.” Aerodynamics and weight are the two factors that dominated the changes in the 911 GT3 body, in line with Porsche’s motorsport developments. The front and rear ends have been optimised and are constructed mainly from polyurethane, in order to reduce weight. The new rear lid, rear wing, and wing supports are made from carbon. The new 911 GT3 weighs in at only 1,430 kg with a full fuel tank, or 15 kg less when equipped with the manual transmission,combined with the mechanically-controlled differential lock. The model’s systematic lightweight construction gives a weight-to-power ratio comparable with motorsport levels (PDK transmission: 2.86 kg/hp, manual gearbox: 2.83 kg/hp). Together with the rear axle steering as standard, the adjustable damper system and the dynamic engine mounts, the re-developed motorsport chassis delivers further performance improvements, converting the engine power to superior driving dynamics and agility.The new two-seater sits around 25 mm lower than the 911 Carrera S. Visually, the 911 GT3 leaves no doubt about its sports car credentials. The dominant carbon rear wing stands 20mm higher in the airflow than previous iterations, generating larger downforce. Large air intakes and outlets in the front, bonnet and rear end are a testament to the car’s motorsport aerodynamics. Reflective of the model’s superior driving experience, the interior features a GT sports steering wheel which originates from the 918 Spyder.The standard Sports seats Plus with enhanced seat side bolsters, can be exchanged with three other optional seat variants; including full bucket seats made from light carbon fibre-reinforced plastic in a carbon-weave finish. In addition to Porsche Communication Management (PCM), standard equipment also includes the Connect PlusModule and the Track Precision app, enabling all 911 GT3 drivers to display, record and analyse detailed driving data on their smartphone. For enhanced day-to-day usability, the new 911 GT3 can again be ordered with an optional pneumatic lift system on the front axle, which lifts the front of the sport car by around 30 millimetres. This is possible at speeds of up to 50 km/h, and prevents damage to the body caused by uneven road surfaces. An optional Clubsport package, including roll cage, a red six-point seat belt for the driver and fire extinguisher, is also available for more regular racetrack driving and safety. The 911 GT3 model is now available at all Porsche Centres across the country with a basic retail price of INR 23,121,000.